“We do everything from dirt to doorknobs. We maintain lock systems, we build furniture—anything they want, we can build—we do remodels (for example, Walker Hall). We just installed a new dance floor this summer.” His department fixes doors that don’t close, hangs towel bars, paints, and completes concrete work. Summer is his department’s busiest time, when they pack in remodels, big maintenance, and other large projects. In early July after a quick interview, he hurried to his next task, explaining he had 600 work orders on deck. “I used to have my own framing company. I framed homes for 25 years. At my age, I was getting tired of crawling on roofs.” Then a former assistant director in Facilities reached out to Nick, and he became a Technician III—the highest level of carpenter with at least several years of experience. He did that until 2014, when he applied for the assistant director job. “I like working with the people down here. 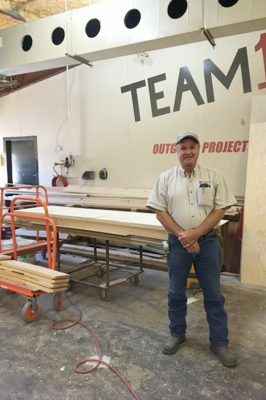 I really enjoy the employees I have working for me.” He said he also enjoys visiting with the people who have carpentry needs. As a residential framer, Nick’s work depended on the weather; if it rained, he couldn’t do his job. Now he relishes working mostly indoors, he said. Nick grew up in Okarche. He and his wife, Liz, are both cancer survivors. Nick is seven years out, and Liz is 12 years cancer-free. “We’re very fortunate,” he said. They have two daughters who both graduated from OKCU with nursing degrees. Chelsea, who is married to Isaiah, works in Oklahoma City at the Spine Hospital, and Karli, newly married to Matt, lives in Houston and works for MD Anderson. Nick’s job no longer requires him to be outside all of the time, but he loves spending time outside in his down time. He likes to spend time at his pool, and he enjoys grilling and smoking food.